Photo(s) by Fishtown PreservationJoy Lang Anderson and the new Fishtown JOY sparkling wine. 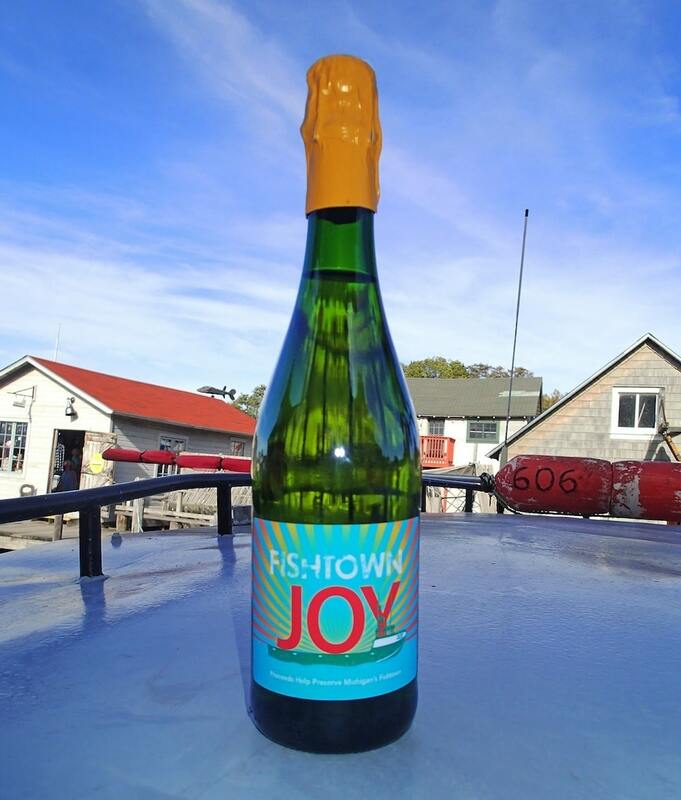 Fishtown Preservation announces a new dry, white sparkling wine called Fishtown JOY by L. Mawby Vineyards. Two dollars from every bottle sold are being donated by L. Mawby to help preserve the historic fishing shanties in Leland and keep them open to the public. The Fishtown JOY label depicts the fishing tug Joy in front of a brilliant sunset over Lake Michigan. JOY sparkling wine is a wonderful addition to your holiday celebrations and gifting—or as a reminder of the joy Fishtown brings to those who have walked the docks for ages, and to the many who have just discovered or will discover it in the future. When you mention “joy,” most locals and visitors think of the beloved green and white commercial fishing tug dockside on the Leland River. Long-time commercial fisherman Ross Lang and his friend George Stevens began building the trap-net fishing vessel Joy near Leland in 1981, launching her in the spring of 1982. Ross Lang named his new tug after his wife Joy (Joy Lang Anderson). For many years Ross made his livelihood fishing on the Joy out of Leland harbor. Today the Joy is owned by Fishtown Preservation and is still a working commercial fishing vessel, licensed for whitefish.